Within foundries, weekly cleaning tasks such as refractory removal require operators to hold up 30-lb (14kg) chipping guns and 40-lb (18-kg) rivet busters to remove the caked-on material inside and around the ladles. Such tasks take as long as four hours to complete, which can lead to muscle strain and an increased risk of injuries. 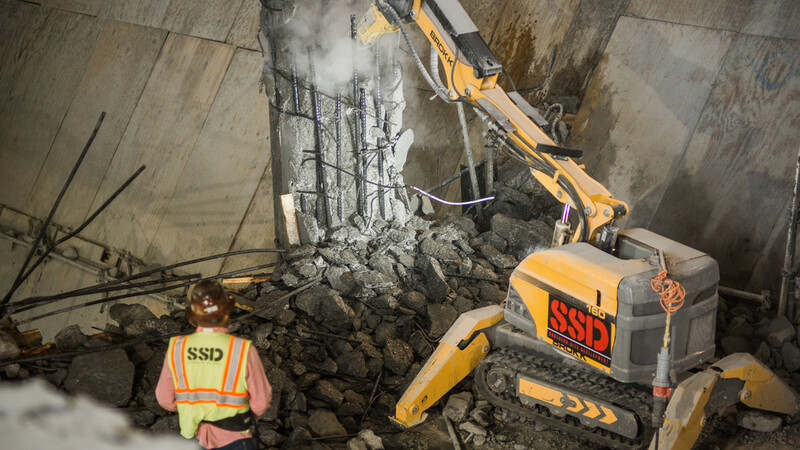 And while chipping guns and rivet busters are effective methods to remove refractory, these tools produce heavy vibrations that transfer directly to the operator. Prolonged use can lead to nerve damage, hand-arm vibration syndrome and other chronic conditions. Luckily, Waupaca Foundry — the world’s largest gray iron and ductile iron casting supplier, headquartered in Waupaca, Wisc. — found a solution that lets them combat the heat and the danger with remote-controlled demolition machines manufactured by Brokk. Waupaca Foundry purchased its first Brokk machine in 2000 to increase the efficiency and safety of the foundry and to reduce injuries to employees. 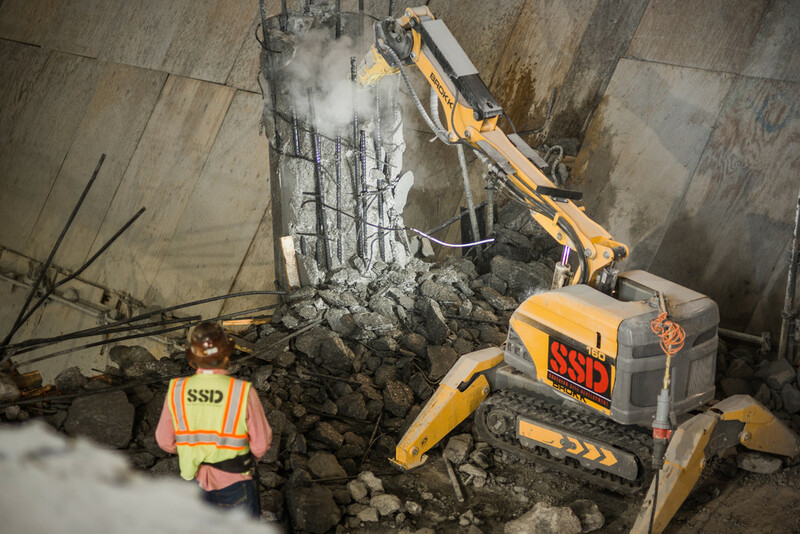 The team started with a 1.6t Brokk 150, used to remove the refractory lining in the 80-ft (24m) tall cupola, effectively minimizing the use of pneumatic tools. After seeing the machine in action, Waupaca’s crew knew it was the best alternative. They were impressed with the size and accuracy of the machine, which is less than 5 ft (1.5m) tall and 3 ft (1m) wide. The Brokk 150 allowed operators to stay away from the high temperatures inside the cupola, which minimized the risk of heat exhaustion. In addition, the machines are electric-powered, resulting in no potentially harmful exhaust. More than 15 years later, Waupaca Foundry now uses five electric-powered Brokk machines in three of its seven foundries. They include a Brokk 150, 180, and 250, as well as two Brokk 100s. “The machines are relatively lightweight and have a long reach, which allows us to do more than we ever imagined,” says Jon Huebner, Waupaca Foundry melt manager. He explains that before using remote-controlled equipment, cleaning the cupola spout required eight laborers using 30-lb (14kg) handheld pneumatic hammers. The task took as long as 16 hours to complete. However, now after using Brokk machines, labor time is cut nearly in half. Incorporating remote-controlled machines completely eliminated the use of rivet busters and dramatically reduced the use of other handheld pneumatic tools. Workers now only use pistol grips to complete any finish work that the Brokk operator might have missed, which usually take less than an hour. In addition to cleaning out cupola spouts, Waupaca uses a Brokk 250 to remove refractory from the pressure pours, which need cleaning every six months. The unit easily handles the applications it’s handed with its robust three-part arm which, paired with an Atlas Copco SB 302 hydraulic breaker, delivers a hitting power of 450 lbf (610J). The remote-controlled equipment simplifies tasks, such as scaling the walls of the holding furnace. A once formidable task, which took five laborers and three to five 10-hour shifts to complete, now only takes two 10-hour shifts, an operator and spotter. Today the Waupaca Foundry Brokkologists approach the jobsite prepared to combat the dust, debris and high temperatures. The remote-controlled equipment has not only provided hard-hitting precise power, but also versatility, enhanced productivity and, above all, safety. “The Brokk equipment was certainly the most productive choice for our foundry,” Heger says.